The Open Networkers can see it everywhere now: Traditional web 1.0 - web 2.0 portals are declining in popularity, networkers in general want more quality (quick) interaction instead of quantity (and time consuming) 'information'. First let's make it more clear what we are talking about (click the image on the right). On the vertical axis: is the network more oriented towards 'giving' you 'status (amounts of 'followers' / 'fans' / 'friends') or is it more oriented towards self-expression & development? On the horizontal axis: how able is the social network in enabling 'normal' human communication? Most online networkers tend to stay 5 years in one phase of their online evolution. Up to now, most people where in the 2 first phases (left) of this model. The Portals mentioned in phases 1 and 2 now seem to have reached a peak in their popularity (they might still grow in numbers of profiles but their 'unique daily visitors' decline or stagnate) and more and more people are seeing that these networks do not offer a lot of Value. For a moment it was funny to send out virtual 'flowers' or 'hugs' on social media but also there we can see that people are getting bored with all these 'dating' applications which are also very time-consuming. So what are we looking for in the next phase of online social and business networking? In general we are seeking to get a real human experience and to be very selective with whom we share that experience. In order for that to happen we need quality Profiles, not just showing words, but also profiling rich material such as video and photo's. Furthermore we want tools to directly interact by voice and (online) personal presence if possible (web-conference and sharing). Up to now these tools where very immature, they where technical by nature and we needed to do all sorts of things in order to install or use them on our computer. Most of the new technologies seemed to have to go through a 'trough of disillusionment' but are now in a maturing phase. 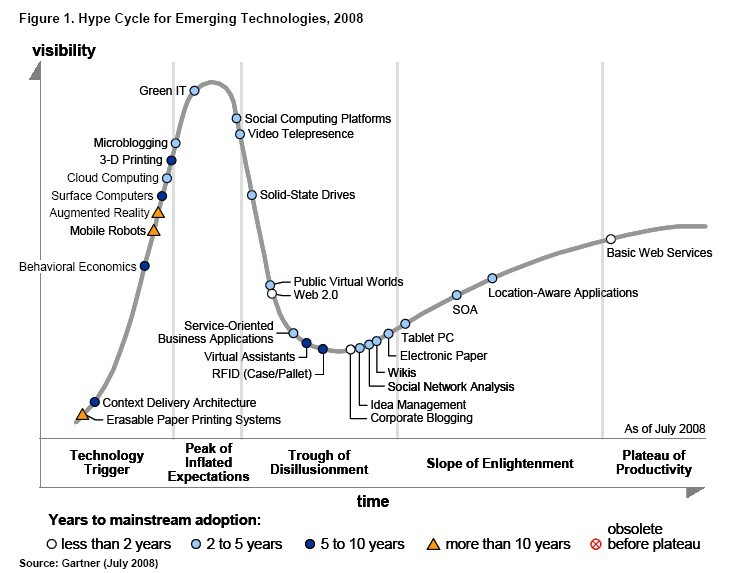 Gartner published this matrix which roughly shows you some technologies and their maturing stages. The next generation internet is very transparent, it will show exactly where you are, who you are and what you are doing or want to do using those new maturing technologies. So it is time to really think about the message you are sending out with your online Profile, we are getting serious. But being serious doesn't mean that we don't want to have fun, as long as it is more 'business' and reflects the 'real' world. Ning.com is a first example where people can create their own social niche network. Do you want to create a network for enthusiasts about windscreen-wipers? No problem just go ahead, it's free. Those small niche -networks are very targeted, offer rich profiling and if you are e.g. a company fabricating windscreen-wipers you'll be on the lookout for exactly these kind of spirited people. So that is where the Value is even if there are just a handful of members there. It's the quality of members that count. So it would be very interesting to see if the emerging technologies behind LivePlace.com will be mature enough to our new standards, because it seems very promising indeed, coming at just the right moment. Web 3.5 is where we start interacting using avatars (like in SecondLife) and are able to use our other senses as well such as 'touch' or 3d experiences. web 4.5 is the environment where we can sense holograms using our senses, already there is some progress in this field which you can read in the attachment on this page (scroll down a bit). Web 5.0 is the environment where every aspect is holographic, including senses. In web 5.0 we are able to interact using special suits using holograms meeting with other holograms in a virtual but very real world.